This loop is located in a large green boulevard that stretches along the western side of a street named 1st Botkinskiy Proyezd, obviously. 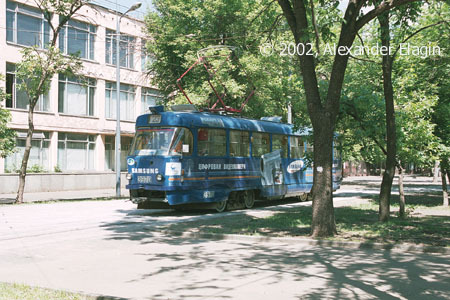 The terminus was constructed in 2002 following the mass protest campain against the closure of the line along Leningradskiy Prospekt that would otherwise be cut up to another terminus beyond Sokol metro station, leaving the whole length of the Prospekt without trams. 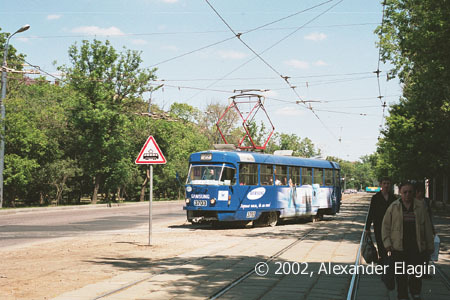 Presently this terminus is used by trams of route 23, the only route that operates in Leningradskiy Prospekt for many decades but with rather short headways. The street itself is named after Sergey Botkin, a famous Russian doctor. A hospital that is located a little away from the terminus also bears the name of Sergey Botkin since 1920. Previously the hospital was named after Cosma Soldatenkov - one of the most notable philanthropists of 19th century in Moscow who had established and funded it. Nevertheless his name has not been forgotten, and a monument in his honour was erected nearby in 1992. Tatra T3 #3703 turns from the old line that now leads nowhere to the reversing loop. 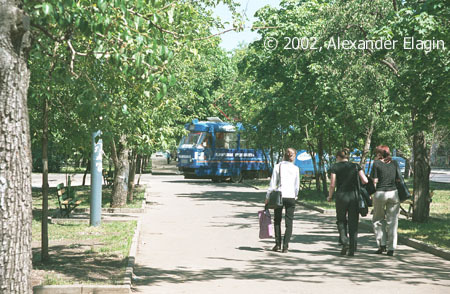 The remaining part of the line that once lead to Vagankovo and further today functions as a service stub. Another bright illustration of peaceful co-existence of trams, trees and pedestrians. The tram crosses a foot-path before arrival to the terminus. The reversing loop is very simple: just a single-track loop and the stub that I have already mentioned. With passengers aboard, #3970 leaves the terminus bound to another terminus of route 23 - Mikhalkovo. March. 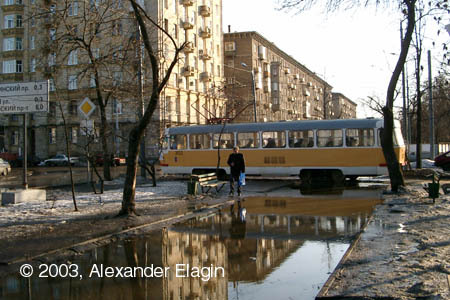 It is thawing in Moscow, and flood-waters fill all the spaces they can find. And this foot-path also looks like a small pond - not for a long time, of course. 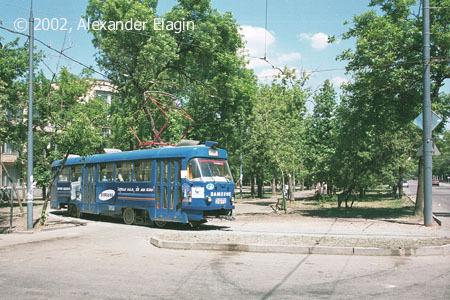 As for the tram, it has been spotted at the same place as in the previous photo, but viewed in the opposite direction.